Amazon Fire TV vs Amazon Fire TV 4K Ultra HD, What's The Difference? Online Music Store Amazon Fire TV vs Amazon Fire TV 4K Ultra HD, What’s The Difference? These two products have more similarities than differences as evident in most of their reviews. This,however, doesn’t mean they are the same in every aspect. Both are amazing streaming devices but they also have some key differences. Amazon is known to be a tightly lipped company when it comes to what goes on inside their little black boxes. It is hard to get a good idea of the key differences unless you do a full product review of both and catch the differences from there. However, both are good streaming devices with thousands of units sold for each. It is obvious that people want the best picture and video quality when viewing and streaming content. This is one reason people acquire High Definition television sets and upgrade as soon as a better one comes to market. With both the Amazon Fire TV and Amazon Fire TV 4K Ultra HD, resolution quality is not an issue at all. The Fire TV stick provides 1080p resolution known as High Definition and it is crystal clear. On the other hand, a Fire TV 3 is compatible with 4k which is known as Ultra High Definition. If you have a TV set that has a resolution of up to 1080p, the Fire Stick is an excellent option. There are newer TVs on the market that are available in 4K UHD and this one is great for the Fire TV 3. You can’t use the Fire TV 3 with a television set that doesn’t support $K quality and HDR support. When it comes to performance, the difference between Amazon Fire TV and Amazon Fire TV 4K Ultra HD is quite persistent. 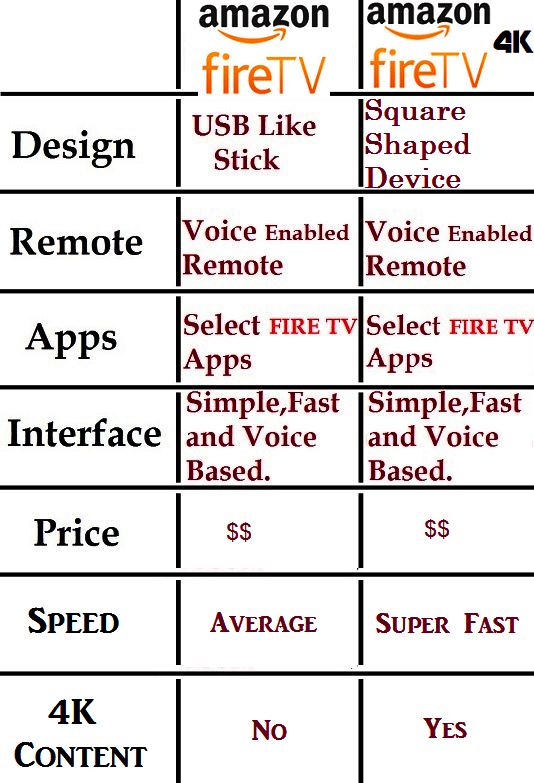 The Amazon Fire TV known as the Fire Stick is more than twenty second slower when booting. It is also twice as slow to open YouTube, Netflix or even a video from the basic Amazon Prime. The Fire TV box is faster and doesn’t buffer or skip while streaming content. You don’t have to keep waiting for the video to load and when it loads the quality will let you down while buffering will finish you off. When the two devices run on the same operating system, the Fire TV Stick is less powerful. It can support games but not as many games especially if they are technically demanding. For the gamers, the Fire TV box is the best bite. It supports a lot of games even the technically demanding ones including, Grand Theft Auto, Minecraft, the Walking Dead, Max Payne and The Wolf Among Us. The Fire TV stick cannot support these games,but it can support the lightweight ones like Wind Up Knight. If you are a gamer, stick with the Fire TV box,but if not, then the simple Fire TV stick will suffice. For the tech gurus, this is one of the fundamental things you look at to determine which device is faster than the other. Both the Fire TV Stick and the Fire TV 3 have the same 8GB capacity,but when it comes to the memory, they are different. This is evident due to the speed of these devices. Memory is a critical factor when making a decision which Fire TV is best for you. The reason Fire TV box was deemed to have higher memory, is because it’s faster than the Fire TV Stick and this was noted when testing both of them on different functions. From powering the device, playing a video to opening an app, the Fire TV 4K UHD is much faster. This, however, doesn’t mean that the Fire Stick is slow, but when you compare the two, you will see less lag and buffering on the Fire TV 4K UHD. This is more evident when you are side loading apps such as Kodi and Terrarium TV. When it comes to storage, the Fire TV 4K UHD is the way to go. It has the option to add external storage through a MicroSD card or a USB flash drive. You can load music, videos and other personal files directly in your Fire TV with the help of the extra storage and some third party apps. This is one of the key differences between these two devices. The two devices are offered at a fair price but with a variation. The Fire TV 4K UHD device retails for $$ while the Fire TV Stick goes for $$. The price is fair for both the devices since one of them is like an upgrade of the other. If you are looking to upgrade, make sure you have a TV that supports 4K UHD and also has HDR support. This way, you can use either of the devices without limiting the potential of the higher one.